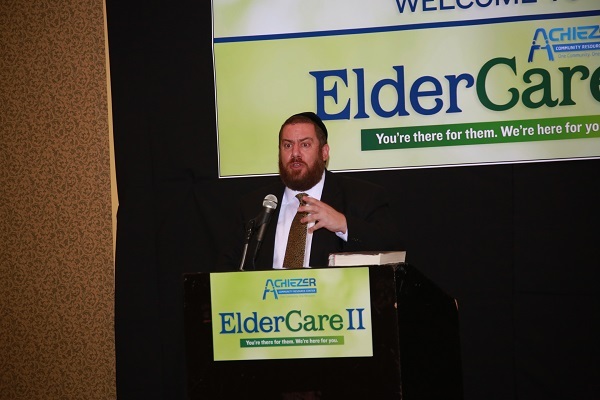 Eldercare II, Achiezer's long-awaited eldercare conference, was a runaway success in every sense of the word. From all walks of life they came: middle-aged children, doctors, Rabbonim, spouses; residents of New York City, Williamsburg, Monsey, Connecticut, Clifton, Lakewood. All with one goal in mind: to provide the best possible care for the seniors in their lives. "Even if I had left half an hour into the first session, it would have been 110% worth coming," reported one enthusiastic participant. Indeed, the sessions surpassed all expectations. People were literally turned away at the doors of several sessions, as the wall-to-wall crowd took up every available inch of space. Asset Protection Planning, led by eldercare attorney Ronald Spirn, which covered virtually every aspect of Elder Law. The session ran twice; both times, to an overflow crowd. Medicare & Retirement Planning, led by Steven Kass and Shlomo Bassalian. The room was jammed with middle-agers and seniors, eager to learn all they could about planning for the future. Dealing with Dementia, led by neurologist Dr. Marshall Keilson; dementia specialist Susan Methal, RN; and Mrs. Henny Friedman, RN, whose husband currently suffers from dementia. The overwhelming amount of attendees highlighted the extreme need for information and support in this particular area. Caring for the Caregiver, led by Dr. Rachel Lowinger, was filled to overflowing with caregivers of dementia patients, who headed directly from the dementia information session to this one, for a much-needed dose of Chizuk. When Home May Not Be An Option, led by Brian Rosenman, Mrs. Gittie Neufeld, and Dr. Zev Carrey, provided illuminating direction and guidelines regarding the difficult decision of placing a loved one in a rehabilitation or nursing facility. Hospital-Based Challenges of the Critically Ill Patient, led by Rabbi Dr. Aaron Glatt, Assistant Rabbi of Young Israel of Woodmere; Dr. Beth Popp, Director of Palliative Care and Hematology/Oncology at Maimonides Hospital; and Jonathan Rikoon, JD, partner at Loeb & Loeb; served as a perfect blend of halachic, medical, and legal information for caregivers of patients in critical care situations. All of the sessions offered Q&A at the end, culled from questions penned by listeners during the sessions. The evening was topped off by the keynote session, presented by Rabbi Ephraim Eliyahu Shapiro and Rabbi Yaakov Bender, whose words of Chizuk and inspiration left the crowd inspired and empowered to continue in their difficult but potentially uplifting role as caregivers. Over thirty vendors manned booths offering every product and service available in the field of eldercare: from Shabbos ramps to home health aides; pharmaceutical products to nursing homes; life insurance to estate planning; and much more. An expansive sushi and dinner buffet, compliments of Gourmet Glatt and Simply Sushi, kept the attendees sated and energetic throughout the jam-packed evening. The overwhelming feedback and enthusiastic response has energized Achiezer to already begin planning ahead to next year's conference, which promises to be even more comprehensive. Because nowhere else in the world can you find a society more concerned about caring for our elderly population, in the very best way possible. Achiezer offers its appreciation to Caring Professionals, the primary corporate sponsor of Eldercare II. Audio recordings of the concurrent sessions as well as video footage of the keynote address are available here. All questions, comments and feedback are welcome via phone or online contact.